I've been wanting to do this art foreverrrrrrr. I feel like I've slacked on the nail art front just with all the boxes, exclusive group customs, PPU, HHC, haha. I try to do nail art with these polishes, but I really do love to wear my art vs swatch art. So I caught up on swatching and knew I could wear this for a few days, so blam! Tie Dye with Lechat Dare to Wear Indie Fest! Oh hello! Let's say hello to a new week! I'm kicking it off with Stella Chroma's newest offering for Polish Pickup! Inspired by The Wizard of Oz and the scene in the poppy fields, this rich blue polish and coordinating scent are really lovely. How to explain this awesome shimmery item? It's listed as a neon shimmer, but it's anything but! It's way cooler! Sometimes, I forget what I have coming from BBB and so I originally thought this was a mermaid-type shimmer. Imagine my surprise when it turned out to be a pastel multichrome! Ok, let's chat! Happy Friday! Today I'm sharing the three newest editions of the concert from Girly Bits. I've loved her concert releases in the past. Astoria is one of my favorite GBs! These three multichromatic beauties are available now and head to the end of my post for a coupon code! More musical love, and this time, it's based on one I know very well! Since I mentioned before that I grew up just outside of New York City, I was able to attend many Broadway shows. I remember my father taking me to see Phantom of the Opera and being mesmerized by an amazing effect in the theatre (I won't spoil it). But this polish is inspired by Phantom of the Paradise, which was inspired by Phantom of the Opera. I've never heard of it so this was something new for me! The boyfriend wanted watermelon nails, so why not?! I decided to do a gradient with a sponge, and after I finished, I realized how much easier it would have been to stamp the gradient! So I fully plan to re-do this manicure, but I did like the look of this anyway. It's one of those nail arts that look great in person but meh in photos! Cast A Spell Box, Happy Birthday Harry Potter! Hold the phone, errrbody! It's Harry Potter's Birthday month! That means it's time for the annual Cast a Spell box, hosted by Night Owl Lacquer. This box celebrates Harry with polishes based on spells from the series! I had to get schooled on the spells and now I'm fully educated on these polishes! Some of them are just so perfect in my head! I like Harry Potter but I've seen like the first three movies and some of the last one lol. I stink. But I do love a gorgeous polish with sensical inspirations! Hi there! I have three offerings from Bee's Knees Lacquer today. I received this at Indie Expo Canada, and then I bought some more! But first, I wanted to share these three. Bee's Knees is just everywhere lately! They release regular collections, have PPU colors, they are in boxes! So over the past month, I've been able to try out a lot of their colors and I am loving it (just back tomorrow for a super duper special color!). I have more PPU to share and Alter Ego was inspired by Fantasia. I remember watching this movie as a kid and thinking snoooooze. It wasn't until I was older that I realized how magical it was. Ahhhh, Disney. I love this complex color, and I just imagine brooms dancing right now! Happy Friday! Today, I'm finally sharing the nail polish portion of the Indie Expo Canada VIP Bag. If you go to these conventions, there's usually an option to get early access shopping as well as a bag filled with goodie. I shared the bath and body VIP bag earlier, but I wanted to share the VIP portion! Since I grew up 15 minutes out of New York City, I spent my whole childhood seeing a variety of Broadway shows! I am definitely looking forward to seeing all the interpretations of the musical theme. KBShimmer went with the movie Grease. True story, I have never seen this movie. I just could not get into it when people would put it on. But that being said, I'm all about this polish! Told you I would be back with the July Pusheen! I got it together with this one and I loooove how it came out! Like I mentioned in my June Pusheen post, I'm noticing a theme! In fact, last July was also ice cream based! I think I made it look different enough though and it's so cute! So I love fun stamping plates and I love outer space so this was sort of a match made in heaven. I love doing galaxy manis, so I decided to take the galaxy mani and use a different palette. I swatched the Jessica Summer 2018 Gypsy Spirit collection last month, and I looked at it for a while before I said, galaxy mani time. Good evening! So I'm a little late with this post, as June 29th, I totally ripped off my ring and pinky nail. These are my nails with two weeks growth, so you know they must have been super short! 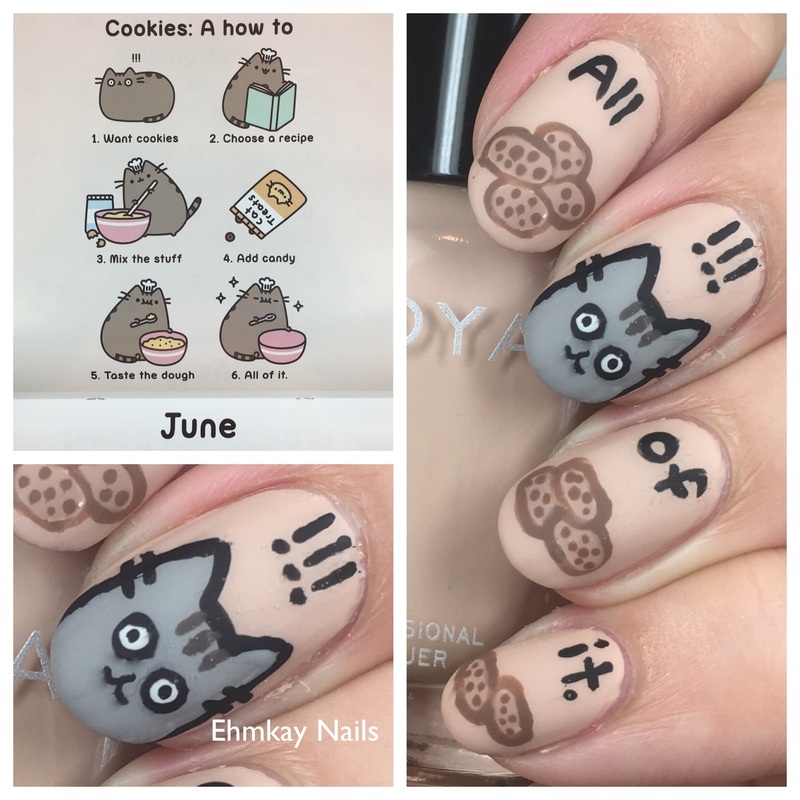 I didn't want to give up on my Pusheen Calendar series, so I'm posting June's now. Whatever, give me all the cookies! If you're like me, you have dozens of wheels of loose sequins, glitters, and rhinestones sitting around but you're too lazy to deal with them but it takes forever to place them. Today, I'm sharing a super simple pencil that helps ease the process of placing glitters! Check out my review below! Happy Friday! I hope you have fun plans for the weekend! I'm hoping this is my last weekend in this boot for my broken bones in my foot! Everything in NYC involves walking and with the heat plus a boot, blah! But I'll be tuning into the World Cup final! 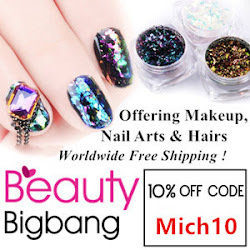 I have a few products from MoYou Nail Fashion, which is a stamping company, so let's go to it! Good evening! Hope you had a great day! Yesterday was amazing for me, since Croatia won the game and will be going to the World Cup finals! This is sooo exciting! Have you been watching The World Cup? It's been my life haha. Anywho, I have the newest offering from Stella Chroma for Hella Handmade Creations. Remember, HHC is now based on brand's choosing a theme and it will be available July 14th-July 21! I have an older color that I wore ages ago, but again, this sat in my drafts! I remember wearing this for a week, because it was probably right after my semester ended and I took a break from life haha. Either way, I find that flakes make me happy and I can wear them for multiple days. Hi all! 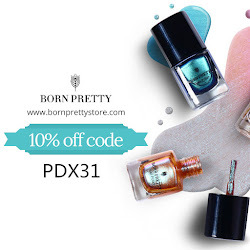 I have these totally adorable decals from Born Pretty and in fact, I'm still wearing this manicure! I love water decals because they are so easy to use and this colorful and sweet look is right up my alley. So I figured while my nails were growing out, I would continue to share some bath and body products. I shared the products of the VIP Bag HERE and today I'll be sharing press samples, which the makers gifted me as I met with them an interviewed them in my expo coverage HERE. Today I'm sharing the bath and body contents of the VIP bag. You had the chance to upgrade your ticket from admission to VIP which allowed for earlier access to the event as well as a VIP bag filled with lots of mystery and surprise products. I have my entire review of the event HERE, especially if you want to see more about the makers involved. I found this one sitting in drafts, and well, I love it so I'm sharing it! I think I was in a subtle polish mood when I put this on. I really love dusty pastel colors like this, so I think that's why I gravitated toward the Dare to Wear English Rose Collection. Hi all! Hope you had a nice Fourth of July if you celebrated! Mine was laid back. The heat wave has been so gross here in NYC. Also, if you live in this area, the beaches are a mad house and just not fun. I need a swimming pool to go to! That's my style on such humid days! 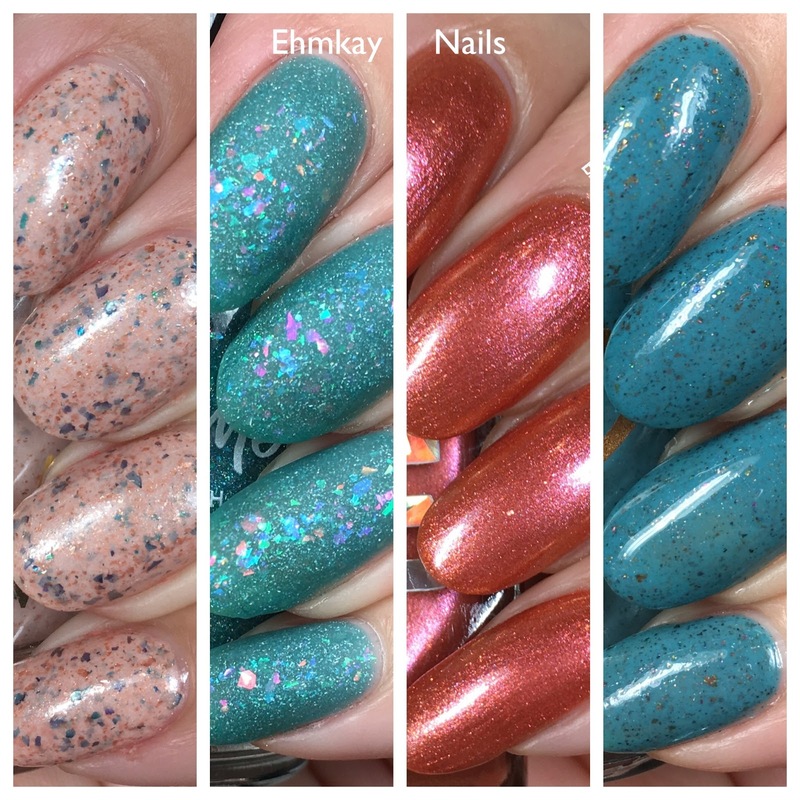 Anywho, speaking of fancy lifestyles, I have Alter Ego's new Facebook Group exclusive polish! So, my nails are in a serious funk. I break a few bones in my foot and then broke off two nails fully. I did my nails for me just to be festive for tomorrow, but two friends encouraged me to still post them! I'm feeling bummed about my nails being short and uneven, but I'm human. I have so much to swatch, so I'm hoping they look nice in another week. If you haven't heard, Polish Pickup for July will be doing a rewind. Each maker is bringing back one of their Polish Pickup polishes, and will be selling through their individual site. Most makers did individual polls in their fan groups, so you are getting what you asked for! Since every makers chose a different color, I'm sharing the ones I have!